The average man or woman who has no interest in aviation beyond having committed it unwillingly as a fare-paying passenger, would probably say: "See one aeroplane seen 'em all". However, there are some airliners which stand out from the crowd to such an extent that even non-enthusiasts would recognise them. In the fifties there was the Lockheed Super Constellation, a triple-tailed beauty whose art deco lines set her apart from the other piston powered airliners and made her the subject of choice for any artist needing to depict an airliner of the fifties. In the sixties it was the Boeing 707. Whereas the Connie had inspired graphic artists, the 707 inspired a generation of song-writers. In the absence of any songs about the DC-8, the Comet, the Tu-104 or the Caravelle, it must be concluded that the 707 was indeed something special! Towards the end of the fifties, the days of the piston powered airliners were numbered. Piston engines had gone about as far as they could go and something more powerful and reliable was needed. The next generation of aero engine, the jet or turbine, had fewer moving parts and those that did move were doing so mostly in the same general direction! The aircraft manufacturers of several nations were competing to be the first to put a jet powered airliner into service and whilst most were technical successes, it was left to the Boeing 707 to be a commercial success and the iconic airliner shape of the sixties. The classic swept wing with jet engines in individual wing-mounted pods is still a standard configuration for airliners to this day. Prior to the advent of the 707, Boeing was not a notable builder of airliners. In the thirties they had built the twin-engined Model 247 which was an also-ran to the DC-3. In the fifties they built the huge Stratocruiser which was saddled with over-developed and therefore unreliable piston engines. Neither was a commercial success although the Stratocruiser did achieve greater success as a military transport and tanker. Indeed, military work was Boeing's bread and butter, having built the wartime B-17 Flying Fortress and B-29 Superfortress in large numbers. After the second world war, Boeing continued the bomber theme with the jet powered B-47 Stratojet and the giant B-52 Stratofortress. It was with these latter types that Boeing leapt to the forefront in the construction of large jet aircraft. These military programs left Boeing with a wealth of experience that begged the development of a jet transport. That Boeing did develop a jet transport was something of a leap of faith by the company as the resultant Model 367-80 was funded entirely by the company, such was their confidence that military and civil orders would be forthcoming. Boeing committed to the construction of this company-owned demonstrator on 20 May 1952. 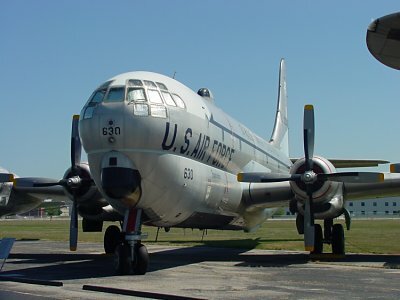 The Boeing designation indicated a development of the Model 367 which was better known as the military KC-97 Stratofreighter. at the USAF Museum in Dayton, Ohio. Happily, when the new jet transport was rolled out for the first time on 14th May 1954, it looked nothing remotely like its alleged ancestor. This aeroplane was beautiful! It had also cost Boeing $16 million of its own money. Destined to go into production for civil use as the Model 707 and military use as the Model 717, the Model 367-80 prototype was more commonly known simply as the "Dash 80". 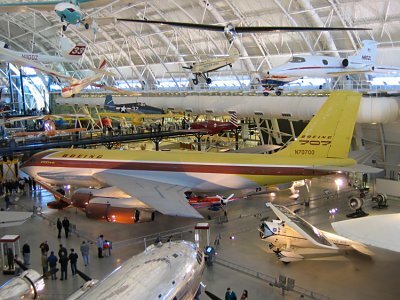 (This famous prototype survives to this day in the National Air and Space Museum in Washington). near Washington Dulles International Airport. In reality, the Dash 80 was neither a 707 nor a 717, although Boeing did signal its immediate aspirations when the aeroplane emerged with practically no cabin windows and two large main deck freight doors. As an intended replacement for the KC-97, the Dash 80 was the last of many design studies intended to breathe new life into a design which had its genesis in the wartime B-29 bomber. Although it retained the model number of the KC-97, the Dash 80 was virtually a totally new design. Indeed, the only feature it shared with the KC-97 was the 132 inch fuselage width! The fuselage of the KC-97 had a very pronounced double lobe cross section alternatively known as a "figure 8" or "double bubble". Whilst the Dash 80 retained this feature, the blend between upper and lower components was more subtle. The wing on the Dash 80 owed nothing to the KC-97 for it had obviously come from the B-47 and B-52 side of the family, sharing their 35 degree angle of sweepback. The new aircraft was to be powered by four Pratt and Whitney JT3 turbojet engines, each producing 10,000 pounds of thrust. (This engine was the commercial equivalent of the J57 which powered the B-52 bomber). Having decided that the aircraft should have four engines, it had been proposed that the engines be paired in a single nacelle or "pod" on each wing. Although this pairing philosophy was consistent with the six-engined B-47 and the eight-engined B-52, it soon emerged that four engines would permit the use of an individual pod for each engine. Herein lies what is probably the 707's greatest contribution to modern jetliner design. A single engine isolated in its own pod is less likely to damage another engine in the event of a catastrophic failure. For the same reason, a pod location is safer than "burying" the engines in the wing root as was done on the Comet and the Tu-104. A pod location provides superior access for maintenance and removal/installation. Location of the engines in wing-mounted pods provides "bending relief" for the wing, thus permitting a less rigid and therefore lighter wing structure. Almost two years to the day after project launch, the completed 367-80 was rolled out of Boeing's Renton plant on 14 May 1954. What greeted the assembled press and Boeing staff was a stunningly sleek aeroplane, clean of any external protuberances, and certainly without any unsightly and drag-producing radio aerial cables. In consequence of the aeroplane's lack of an immediate customer, it wore Boeing's house colours of chocolate brown and canary yellow and carried the appropriate civil registration N70700. However, Boeing were not without a customer for long. In September 1954, the United States Air Force, which had earlier declined to order a "paper aeroplane", placed an order for 29 KC-135A Stratotankers, thus vindicating Boeing's courageous decision to fund the construction of a prototype. (To Boeing the tanker was known as the Model 717, but this designation was not widely used. Indeed, Boeing were later able to reissue the model number to the MD-95 version of the DC-9 which they had inherited in their takeover of McDonnell Douglas). The production KC-135A was similar in most respects to the Dash 80 although the aft main deck freight door was eliminated. The most notable difference was that the fuselage of the KC-135 was twelve inches wider than the Dash 80. With production of the KC-135A tanker/transport well underway, Boeing were able to concentrate their efforts on turning the design into an airliner. The first production model of the airliner was known to Boeing as the 707-120 although its type certificate and other FAA records called it a 707-100. The aeroplane was marketed to the world's airlines as the "Jet Stratoliner", with "Jet" an important qualification as the name had been used previously on the Boeing Model 307, the world's first pressurised airliner which had been based on the B-17 bomber and which flew for the first time on the last day of 1938. The "Jet Stratoliner" name quickly faded from use in favour of just the model number 707. Curiously though, Qantas engineering lecture notes on the 707-138B dated May 1964 refer to the aeroplane as the "Boeing 707-138B Stratoliner". The 707 airliner differed significantly from the KC-135A tanker/transport in that the fuselage was four inches wider and ten feet longer, and of course, the cabin had windows! One unique feature of the 707 was the distinctive high frequency probe radio aerial which extended forward from the tip of the fin. This became a characteristic feature of every 707 and most, if not all, of the military variants. As the 720 was intended primarily for shorter sectors, many operators chose to delete the HF probe antenna. Although not fitted to the Dash 80 from the outset, the HF aerial was fitted early in the aircraft's long career as a test aircraft. With the advent of the 707 came an innovative system of designating each version of the aircraft. Pan Am's aircraft were designated 707-121 with the last digit indicating that Pan Am was Boeing customer number 1. Thus the aircraft was a basic model 707-120 customised to Pan Am's requirements. (In practice, Pan Am's customer number became 21 and all other customers followed on from there. Qantas was Boeing customer number 38. The numbers 1 to 19 were issued later). Boeing use this system to this day and thus it is possible to determine from a model number which customer originally ordered an aircraft. The first production 707, which was destined for Pan American World Airways, made its first flight from Renton on 20 December 1957. After almost a year of testing, certification and route proving, the 707 gained its Approved Type Certificate on 18 September 1958. The 707 operated its first commercial service on 26 October 1958 when Pan American's 707-121 N711PA departed New York for Paris and Rome. Although it first entered service on the Atlantic runs, the 707-120 was not a true trans-Atlantic aeroplane as it frequently required fuel stops at Gander, Newfoundland or Shannon, Ireland. Nevertheless, a 707 with true trans-Atlantic capability was not far away and the larger 707-320 made its first flight on 11 January 1959 and achieved its Approved Type Certificate on 15 July of the same year. The 707-320 featured a fuselage 8 feet 5 inches longer than the 707-120, a wingspan increased by 11 feet 7 inches and more powerful JT4A engines. The increased wingspan allowed for the installation of larger fuel tanks which conferred true trans-Atlantic range on the 707. The 707-320 entered service with Pan American on 26 August 1959. With the needs of international operators catered for, Boeing had turned its attention to domestic customers with a lighter, short range version of the 707-120 which was capable of operating from shorter runways. To achieve this, the fuselage length was reduced by nine feet and several aerodynamic improvements were made to the wing. Although originally conceived as another version of the 707, the differences justified a new model number and the aircraft emerged as the Boeing 720. It is said that the new model number was adopted to make the aircraft more palatable to airlines who had earlier rejected the 707 as unsuitable for their routes. Curiously though, American Airlines anticipated public confusion over operating two similar types with different names, so they branded their 720s as "707 Astrojets". So successful was the 707 that British Overseas Airways Corporation (BOAC) ordered fifteen 707s as early as 1956. Although based on the 707-320 model, BOAC required that their aircraft be powered by Rolls Royce Conway bypass engines. This resulted in the 707-420 series for which there were only a few customers in addition to BOAC. Indeed, later 707s ordered by BOAC were fitted with Pratt & Whitney JT3D engines. As a consequence of the BOAC order, the 707 had to be evaluated by the British Air Registration Board for registration in the U.K. 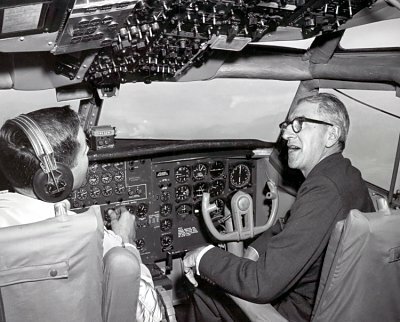 The outcome of these trials was that BOAC's 707s were required to have a fin extension of 35 inches, rudder trim tab travel was to be increased and the rudder was required to have hydraulic boost throughout its full travel, not just the first ten degrees. These modifications were intended to improve directional control at low speeds in an engine out condition. Furthermore, the ARB directed that the aircraft be fitted with a ventral fin, principally as a means of preventing over-rotation on take-off, a situation which had led to the loss of several Comets. It was also believed that the ventral fin would further improve directional stability. These modifications were incorporated in all production 707, 720 and KC-135 aircraft although the air-to-air refuelling boom on the KC-135 precluded the fitment of the ventral fin. Existing aircraft were modified using kits supplied by Boeing. The ventral fin was available in two sizes with the short fuselage 707-120 and 720 generally receiving the smaller fin and the 707-320 and 707-420 receiving the larger fin. Doubts about the efficacy of the ventral fin were apparently upheld when it was eliminated from later production 707-320B and all 707-320C aircraft. Having compared the 707-320 with the 707-120, brief mention should be made of the 707-220. Basically a 707-120 with the more powerful JT4 engines, the 707-220 was indicative of Boeing's desire to meet their customer's needs, with only five being built for Braniff whose routes required the extra performance. The requirement for further models of this type was overtaken by engine developments, particularly the emergence of the turbo-fan engine. Perhaps the most notable example of Boeing's desire to accommodate customer needs, is the short fuselage version of the 707-120 which was specifically developed for Qantas' demanding route structure. Through the elimination of a ten foot section from the fuselage aft of the wing, the empty weight of the aeroplane was reduced by 2,500 pounds. Thus, with the same wing and engines, this weight saving could be utilised for fuel. The resultant reduction in passenger and hold capacity was not seen as a problem given the traffic loads of the time. (In later years, the same philosophy, when applied to the Boeing 747, resulted in the 747 Special Performance for which Qantas was a customer). In the event, Qantas was the only customer for the short fuselage 707 which became known as the 707-138. The 138 was the shortest of all the 707 models except for the Dash 80 prototype, and indeed was 1 foot 8 inches shorter than the 720 with which it is often confused. Note 1 A Boeing publication on the 707-138 dated May 1958 shows an overall length of 134 feet 6 inches and a body length of 128 feet 10 inches (nose to tailcone, excluding tail surface overhang). All of the lengths quoted in the above table are sourced from "The Boeing 707 & 720" (Air-Britain 1972) and presumably originate from Boeing. The introduction of the turbo-fan engine was one of the significant milestones in the history of jet transport aircraft. Gone were the slender nacelles of the original turbojet to be replaced by the larger diameter nacelles of the turbofan engine. This was brought about by the addition to the front of the engine of another compressor stage of greatly increased diameter. This was the so-called "fan" component of the engine. A significant proportion of the air mass passing through the fan was ducted outside the engine core, bypassing the other compressor stages, the combustion chambers and the turbines. For this reason, the turbofan engine was alternatively known as a bypass engine. There were several significant advantages arising out of this new engine design. Mass flow through the engine was increased, thus providing more power at a greatly reduced fuel consumption, which in turn resulted in increased range. Furthermore, the turbofan engine was quieter and it produced cleaner emissions. So significant were the improvements offered by the turbofan engine that most 707s and 720s which had been delivered with turbojet JT3 and JT4 engines were retrofitted with the new JT3D turbofans. Concurrent with the conversion to turbofan engines, 707-120 aircraft were also fitted with the wing improvements which had been developed for the 720. These aircraft emerged as the 707-120B. Boeing 720s modified with turbofan engines similarly became 720Bs. The fitment of JT3D turbofan engines to the Boeing 707-320 series, together with aerodynamic improvements to the wing and larger fuel tanks, resulted in the 707-320B which was to be the penultimate development of the 707. These improvements gave the 707-320B a 15% increase in range, permitting non-stop flights on sectors such as San Francisco to London. The 707-320B flew for the first time on 1 February 1962 and a full Approved Type Certificate was issued on 13 May 1962. The ultimate version of the 707 finally incorporated a feature which had been present on the 367-80, namely a large forward freight door. The Boeing 707-320C featured a 134 inch by 91 inch (3.4m by 2.3m) main deck freight door on the port side forward of the wing together with a strengthened cabin floor and landing gear and increased maximum zero fuel weight. Although these aircraft were convertible to passenger or freight operations or a mixture of both, the conversion was not the simple "Quick Change" process which became popular with later generation short haul aircraft. Usually such role conversions were undertaken in conjunction with planned maintenance. Nevertheless, the convertible facility did offer some degree of flexibility to operators of the type and resale values were greatly enhanced. Some 707-320Cs were delivered as pure freighters with no cabin windows. By 1970, the Boeing 747 was entering service with the major airlines and the 707s were relegated to less dense routes or converted to freighters. Many 707s were "handed down" to the airlines of emerging nations and many became the aerial equivalent of "tramp steamers" roaming the world looking for cargoes of opportunity. At the other end of the spectrum, some 707s became glamour VIP transports for heads of state and high profile entertainers. Sadly though, most ended their days at the scrappers, although many donated their engines and tailplanes to the aging KC-135 fleet. The venerable 707 remained in production until May 1991 as the E-3 Sentry (AWACS) and the E-6 Hermes. When the line finally closed, production had totalled 1,010 Boeing 707s and 820 KC-135s and C-135s. At the time of writing, it is estimated that as few as 140 Boeing 707s remain in service with civil and military operators (not including KC-135s). The following sources are gratefully acknowledged. Added a table of fuselage widths. Added the DC-8 to the table of Jetliner Milestones at the suggestion of Gary Sommerville. Note 1 to the table of comparisons of aircraft length has been revised to reflect new information from a Boeing publication. None of the dimensions in the table have been changed. Changes to the table of comparisons of aircraft length.